Superman #42 continues the lead-up to Lois outing Clark’s identity to the world, and we finally start to see the forces in play that made her do that and the forces that made Superman lose some of his powers. And although we won’t get caught up to the current events occurring in Action Comics, Batman/Superman and Superman/Wonder Woman until issue #44, it’s interesting to see the chain of events that lead up to the big change in status quo. If you were hoping to see Lois out Superman in issue #42, you will be disappointed. Now I know a lot of people are complaining about the fact that this Superman run takes place before the truth is revealed. However we’re getting some really great character stuff in Yang’s run which really adds weight to everything that is happening in the other Superman comics that take place after Clark Kent’s identity is revealed. At the start of the issue we find out who the larger threat is, they are a group called “Hordr”. This organisation uses information and secrets as their weapons, and one of the biggest secrets they know about is Superman’s true identity. 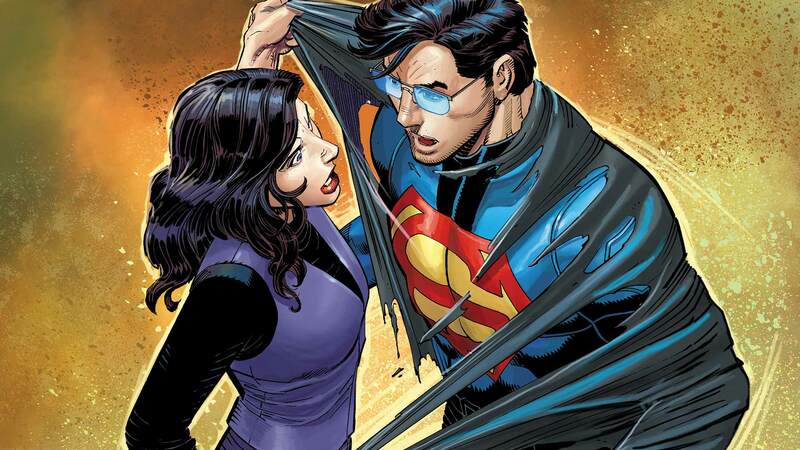 After seeing Clark Kent be a total badass and fight Hordr’s tech zombies, Lois finally figures out that Clark Kent is actually Superman. This is where the interesting character moments take place. The conversation between Clark and Lois after she finds out is quite revealing. Lois is outraged that somebody like Clark who seems so honest, could keep a secret like that. Clark reveals that keeping this secret was the only way he could be normal, to Lois’ confusion. Here’s the thing about Superman, he is Clark Kent, and he enjoys doing normal things. If it was up to Bruce he would be Batman all day every day. Clark isn’t like that. He enjoys the smaller things in life, like being a journalist and having friends. Clearly in Lois’ mind she pictured Superman to be more of this grand saviour who is greater than humanity. Clark on the other hand sees himself as a farmboy turned journalist who happens to also be Superman. Yeah he can shoot heat vision out of his eyes and fly super fast, but that doesn’t mean he doesn’t enjoy just being good old normal Clark Kent. Jimmy Olsen continues to be great in Superman #42. I’m so glad that Yang has chosen to really focus on the original trio that is Clark, Jimmy and Lois. 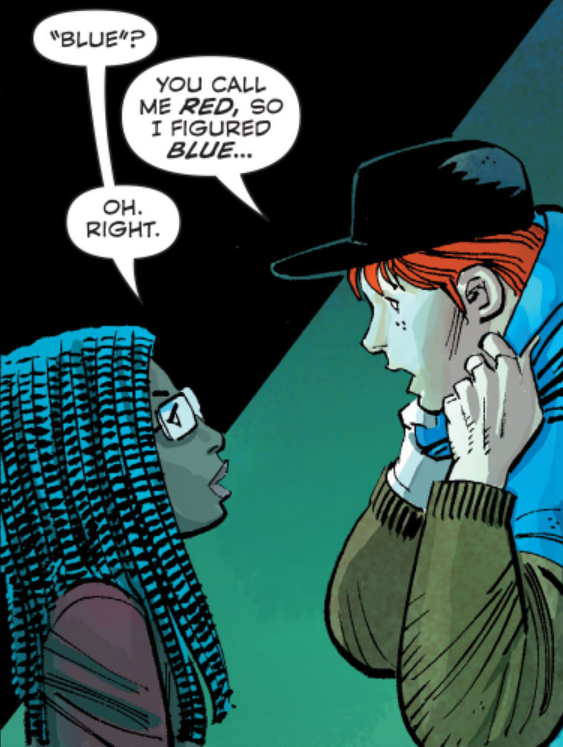 Their interactions were great in the issue, and it’s always fun to see Jimmy be a total dork in front of a girl. Yang also gave us a bit of a Lois and Clark tease. Although Clark is of course still dating Wonder Woman and after Lois reveals his identity to the world we know Clark isn’t too happy about it, so I wouldn’t expect any development on the Clark/Lois romance any time soon. Things start escalating once the gang reach Hordr’s headquarters. We are living in the information age, so it makes sense for a bunch of glorified hackers to be the main threat in this issue. And Superman has one of the biggest secrets of all, so it’s a lot of leverage to have. And really it was only a matter of time before some tech-wise crazy figured out who Superman is. What’s really interesting in the issue is when Superman goes to use his solar flare to take out Hordr. A mysterious figure comes whilst he’s using his powers and does…well something. So who is this mysterious figure in Superman #42? Well that we’re not sure of just yet, but it looks like it somehow absorbed his energy. So the reason why Superman is now de-powered in the current comics is because of this figure. Earlier in Geoff Johns’ Superman run we saw a mysterious hooded person who knew who Clark was, watching over him. Could there be a connection here? The end of the issue ends with Clark badly hurt, of course we know he’s going to be fine, the real question is what makes Lois reveal Clark’s identity? If Hordr knew Superman’s real identity they would have used that information against him to get what they wanted. Perhaps Lois thought to prevent that by removing the leverage Hordr had. Can’t use information against someone if the whole world already knows about it. I don’t think Lois revealed Clark’s identity in spite, she obviously did it for a reason, and that reason has to do with Hordr. In Superman #43 we will see Lois “betraying” Clark, with issue #44 finally catching up to the rest of the Superman comics. It will be interesting to see where Yang’s run goes once his identity is outed to the world. How Clark’s relationship with Lois is handled, and what he will do now that he can’t work at the Daily Planet anymore. This whole Post-Convergence Superman change has been really great to read, but I am wondering how they will maintain this change for the long term. Clark Kent’s secret identity is such a big part of his character. It’s how we got to see Daily Planet Clark Kent and got to see his relationships with Jimmy, Lois and Perry. But I am looking forward to it. Overall Superman #42 was another fun issue by Gene Luen Yang and John Romita Jr. One thing that Yang really nails are the character interactions, which is great to see. Romita’s art is okay, I don’t think I’ll ever be the biggest fan of his work but I do believe his art is getting stronger with each new issue. It will be interesting to see the exact events of what lead Lois to reveal Clark’s identity to the world, and where the story goes from there. 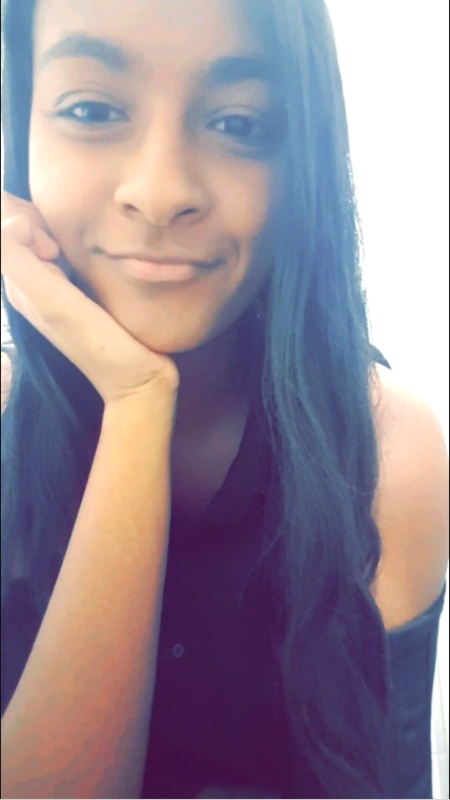 7.8/10. Superhero Movies: What makes a great comic book villain? What will Wonder Woman’s role be in Batman v Superman?